If you are a homeowner in Bloomingdale, Pompton Lakes, Ringwood, Wanaque, West Milford or any other town in Passaic County NJ, you may have bought a home with an older furnace which may not be running as efficiently as it could be. Let us show you how to save significantly by installing a new high energy efficient system. Reports indicate that you could save up to 97% AFUE (Annual Fuel Utilization Efficiency). These newer advanced technological heating units have been created to basically pay for themselves in a short period of time in the amount of energy you will be saving. It is recommended that you provide routine maintenance service on your equipment on a regular basis just as you would with your car. This will lengthen the life of your HVAC equipment, assure that it is running efficiently to keep your energy bills down and that it will be ready in peak form when you need it most. We are a top rated company and we service residential homes in the Passaic and surrounding Counties. This county is known for its predominately converted vacation homes into year round residences. The heating systems were not meant for the biting fall winds and colder winter weather. 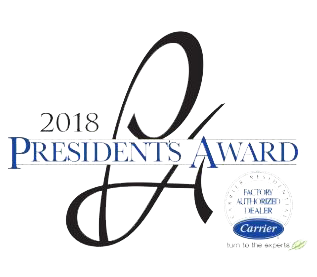 Bloomfield Cooling and Heating, Inc. has been named Best HVAC company by Suburban Essex Magazine’s Best of Essex Readers’ Choice Awards for the past two years and has been recognized by Angie’s List for superior customer service and has just received the coveted “ 2016 Presidents Award” from Carrier. Bloomfield Cooling and Heating, Inc. is a family owned business that has been in business for over 27 years. The company is fully insured and licensed to perform all phases of HVAC work and only employs certified technicians and licensed electricians. Our customer reviews on Google will impress you. We are highly rated for HVAC installations, maintenance and repair services in the Passaic County, NJ area and surrounding counties. We are experts in the field when it comes to upgrading, or servicing an already existing system. Our certified technicians are able to assist you through the entire process. We service Carrier Units, Crown Boilers, Mitsubishi Ductless Heating Systems as well as many other brands. Our services include: gas heating systems, steam boilers, programmable thermostats and hot water heaters. We are offering a heating tune-up and maintenance special to residents in Passaic County, NJ and we warranty that you will not be left in the cold. The cost is $89.00, (a regular priced value of $149.00). We encourage you to call us today, and see why we have so many loyal repeat customers. Reach us by phone at 973-237- 0505 or book your appointment online at www.bloomfieldcooling.com.